Created by Mircea Markus on Mar 1, 2011 6:33 AM. Last modified by Pete Muir on Jun 24, 2011 11:28 AM. Infinispan's XAResource implementation ignores the XAResource.recover() and XAResource.forget() method. As a consequence infininispan transactions are vulnerable to inconsistencies (aCid) when a failure happens in between prepare and commit. E.g. consider a distributed transaction in which an user transfers money from an account stored in the database to an account stored in infinispan. When TM.commit() is invoked, both resources prepare successfully(1st phase). 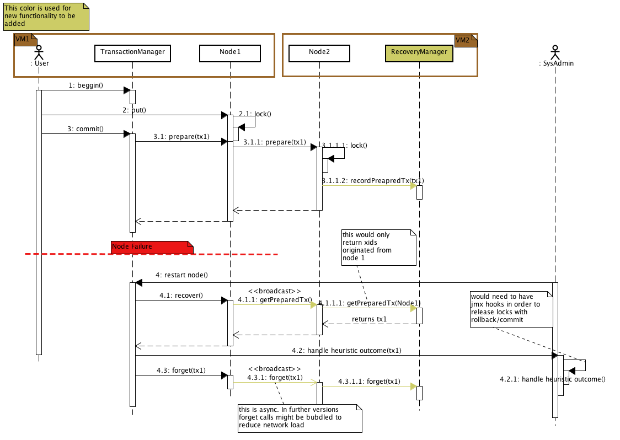 During commit (2nd phase), the database successfully applies the changes whilst infinspan node fails before receiving the commit request from the TM (this exact scenario is handled in 2nd diagram). At this point the system is in an inconssistent state. Recovery deals with this situation (possibly requiring manual intervention) to make sure data ends up in a consistent state. 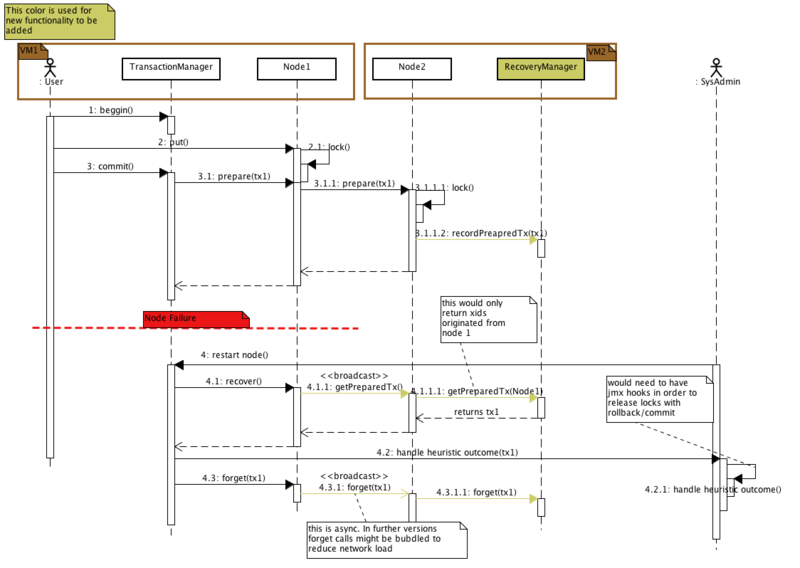 The following sequence diagram show the intended design for implementing recovery functionality. Step 3.2.2 - if the transaction is successfully completed (that includes rollbacks) then this reference is forgotten. When the node is restarted the recovery process is triggered. This calls XAResource.recover in step 4.1. Optimisation: the broadcast can be replaced by nodes proactivelly sending (unicast) their known lists of prepared transactions to the originator. Out of scope for first version. At this moment (i.e. after a node failing) all transactions's changes are in the system (assuming numOwners >= 2). The adimistrator should be able to either rollback or commit the transaction (JMX hooks, TBD). For distributed clusters the number of nodes where prepare RPC is multicasted is variable, depending both on number of keys wrote by that transaction(txSize) and the numOwners. E.g. numOwners=2 and a transactions that writes on 2 keys(i.e. txSize=2) would multicast a prepare to max 4 nodes and min 2 nodes. Generally for the number of nodes to which prepare is sent (noPrepares) satisfy the following condition: txSize * numOwners >= noPrepares >= numOwner. All the nodes that receive the prepare request (noPrepares) would hold this information (next releases, depending on community demand, might allow a configurable number of backups for this recovery info). 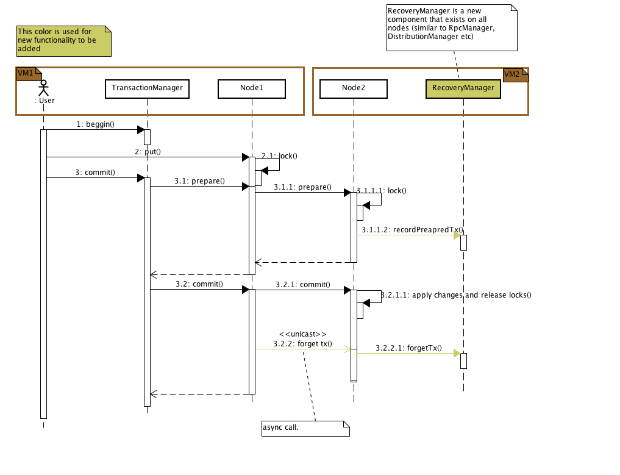 The class diagram below highlights the new classes added to the system. 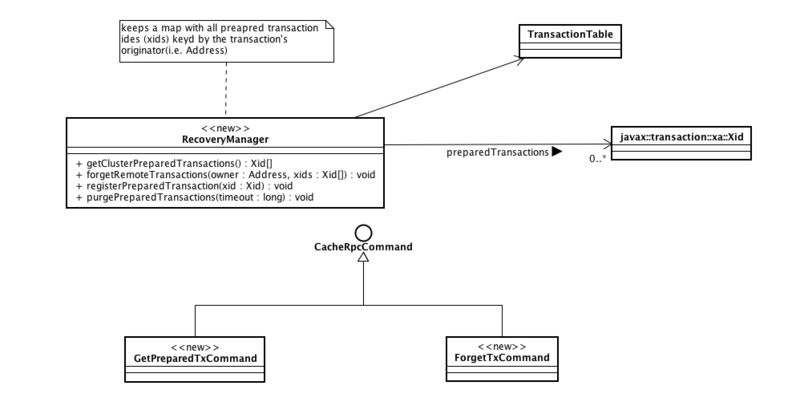 Recovery is configured per cache, within the transaction xml tag. if enabled=false then no recovery information is maintained and XAResource.recover is ignored (warning logged on call). Defaults to true. recoveryInfoCacheName - the name of the LOCAL cache where the recovery information is stored. If not specified, defaults to a local cache that would expire entries older than 6 hours. internalId - this is a unique per Xid system generated id. SA uses this value for completing the transaction (see next operations). 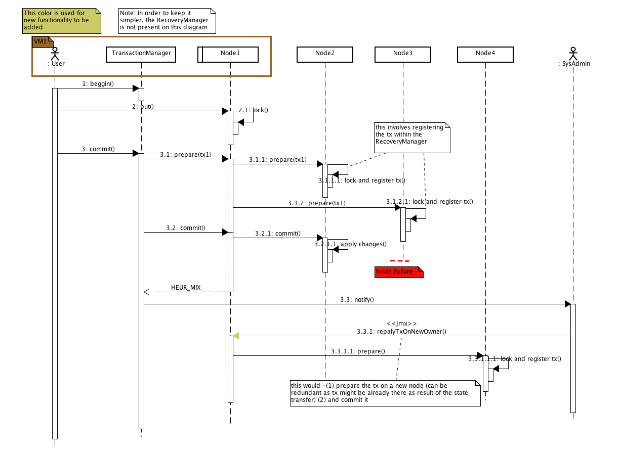 The SA has to visually maps the Xid of the transaction, as received from the TransactioManager's recovery process, to this value. This Xid->long mapping is needed as passing the Xid, which is basically a byte, to the JMX operations is a more complicated approach. 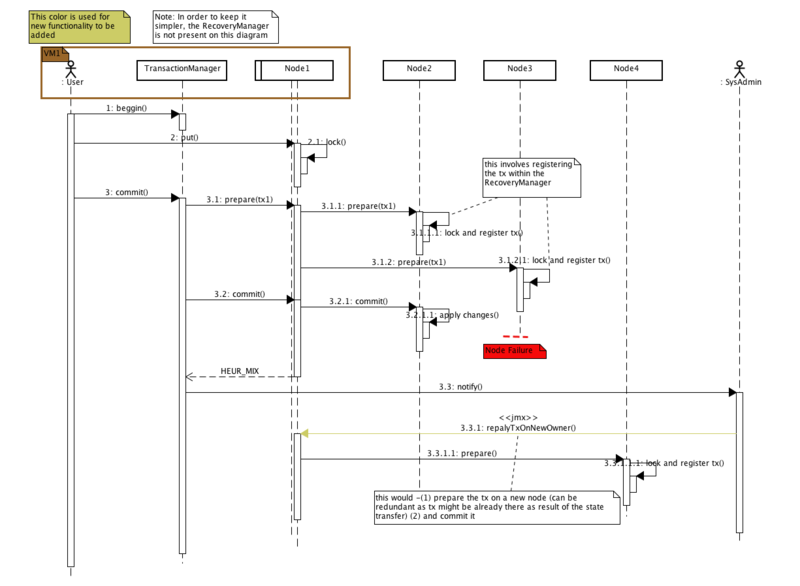 status - a string describing the state in which transactions is, e.g. "prepared" or "huristically committed" (the former indicates tx is prepared on all nodes but commit hasn't been received, the latter means transactions was committed on a subset of the nodes, but not on all of them). These operations receive an internal transaction id (as previously described) and force transaction's completion by either reapplying the chances or rolling them back. The value returned by this operation is a String informing user weather the operation was successful or not. If it isn't successful the user needs to re-run it manually. These operations have the same semantic as the ones described in the previous section. The difference lays in the fact that in this case the transaction is identified through the Xid directly. Whilst these are not useful for manual intervention, they can be used for triggering an automated process: e.g. 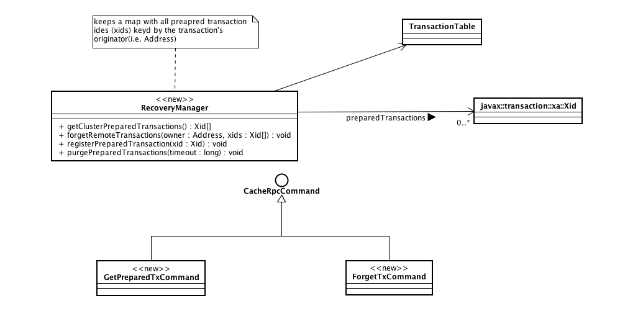 TranasctionManager's recovery process, when finding a in-doubt transaction, calls some java code that invokes these operations through JMX. These operations remove from the system the recovery information related to a transaction. 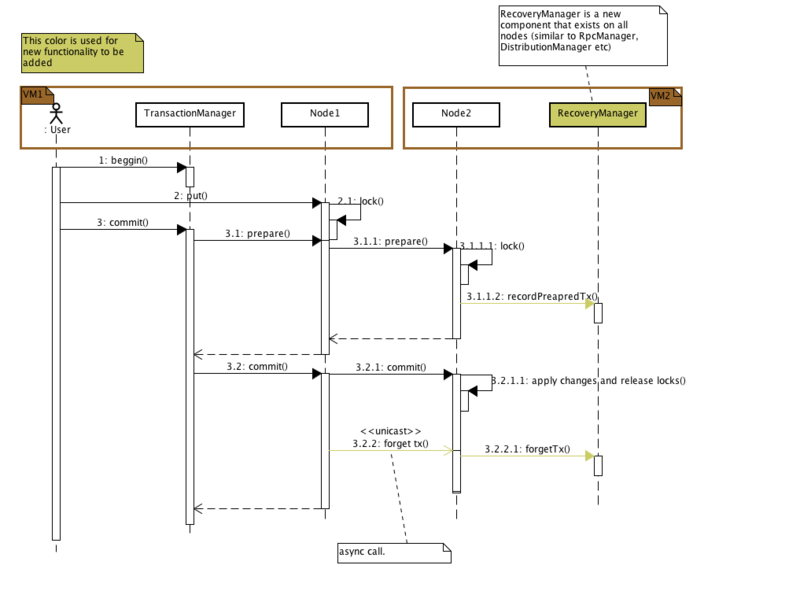 Although this is normally a prerogative of the TransactionManager, these operations are added here for completeness.